Sandalwood Essential Oil (Santalum album) is also commonly known as Indian Sandalwood. Sandalwood Essential Oil has a medium-strength woody, earthy, and slightly balsamic aroma presenting a base fragrance note. It’s an oil with a very high viscosity. Sandalwood Essential Oil is part of the Rocky Mountain Oils Relief, Mood, Skin Care, and Sleep collections. Uplift the mood and dispel inferior thoughts when using Sandalwood Essential Oil in aromatherapeutic applications. The oil helps you move into a deeper meditative state, while creating a calming, grounding environment. Diffuse to reduce irritability, and help balance grief and fear. Sandalwood Essential Oil’s woody aroma helps nourish skin, making it a great addition to aftershave or moisturizer. The oil can also be used as an aphrodisiac and to promote restful sleep. Mix together, turn down the lights, and enjoy your massage. Before going to sleep, massage the blend into the upper chest, back of neck, shoulders, and along the back. Do not drive or do anything that requires full attention after applying the formula. Very rare but possible skin irritant. Apply with a carrier oil for topical application. Wonderful mellow scent. Love it for lotions and baths. Better than most that I've tried. It not only is fine sandalwood, very fine, it was on SALE. What a holiday find!! I love sandalwood, it is my favorite scent. This oil is VERY thick (as indicated in the description). I had to make the hole in the cup a little bigger to allow drops to fall from the bottle. It has a base note and a single drop is enough when I diffuse it and it goes a long way. High quality. A little goes a long way. I use in homemade blends. Great product I use it daily. This is the absolute best smelling Sandalwood ever! Best sandalwood oil I have purchased. Very thick, I take out the built-in dropper and use a regular dropper with this oil. Beautiful scent, great for use when meditating. It's better priced than the MLM brand and has a great Sandalwood fragrance. It's fantastic quality. Decided to try RMO sandalwood because oil was out of stock through MLM company I normally order from, and their Royal Sandalwood was pricey. This is first time I have purchased sandalwood, so can't compare to other brands. The smell is light, earthy and pleasant, perfect for unwinding in the evening. I "warm" the bottle between palms of my hands gently before opening, this seems to allow oil to drop from bottle easier, although still slower than other oils. Will purchase this again from RMO, as well as try other oils. I love this oil. It's one of my favorites! Great price, great product. I had ordered an MLM brand on amazon for more $ and it smelled like alcohol. This was the real deal, smells great. I have loved all the oils I've ordered from rocky Mountain. Some reviewers said the smell of Sandalwood is not very strong. However, unlike Royal Hawaii Sandalwood, East India Sandalwood doesn't smell very strong anyway. If it does smell very strong, then it may be distilled from very old trees (30-80 years) and very expensive, or may have been adulterated. I've bought East India Sandalwood from another reputable company and I'd say the scents/strengths of these two are quite similar. I do have a complaint about the euro dropper of the 15ml size. It takes forever to get a drop and sometimes the drop doesn't dispense at the center. As a result, I wasted a drop or two. The RMO service was very helpful and suggested a number of different ways to get the oil out, including using pipettes. I find Sandalwood oil to be the best moisturizer for your skin. I replaced it for my expensive beauty creams , and I'm very happy with the results. I love the quality of all the oils at RMO. The sandalwood is no different. The scent is amazing and especially nice when mixing for use in men's products. This is a very thick oil. It seems to definitely improve the overall look of your skin on the face. I have used it alone on my face and mixed some in a face cream that I made. it also has a very nice scent. I would recommend it. 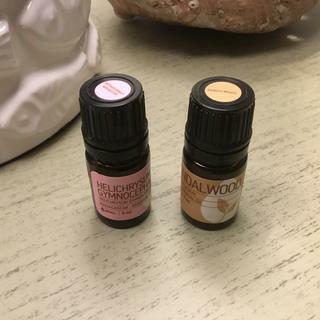 I love the smell of sandalwood from RMO and I use it for fragrances, bath and roll-on perfumes. I'm using it in a few blends and found the smell to be pleasant. My only wish is if there was one that could be diffused since that is my preferred method. I feel i can trust RMO oils. Never had a problem with them. Love this scent. I use it as perfume. And it has many health benefit. Just wish it wasn't so expensive! This is a liovely sandlewood. This is a liovely sandlewood. Not too strong and over powering. I was thrilled to be able to get this on sale as it is one of the very few oils my husband likes. I love it as well. I started with a 5 ml bottle and found that my favorite diffuser and roller mixes used it. I even have a roller with @ 1/3 sandalwood topped with FCO I take to my massage therapist for extra pampering. As much as I use it, the larger bottle just made sense as it's 15 ml for the price of 2 5ml bottles. I have really enjoyed these high quality oils. This is a wonderful oil, smells really good ; deep, earthy and sensual. I love the smell and use it in my skin care routine and as a perfume. Have not used it yet. I love the smell of sandalwood, I'm sure that the oil is going to be very useful. Will update as soon as I start using it. I use this in a diffuser and on in a face serum! I adore the fragrance! Just wish it wasn't so expensive. We loved it. But was a little disappointed at how much it took to be ale to smell it in our diffuser and the bottle was so small. I would love to buy more but that is probably not going to happen because it it so expensive for such a small amount of oil. I opened the bottle tonight. I cannot get the oil to come out. I was going to call you tomorrow. I'm using it to concoct perfume! You know, I can leave a pleasant scent when I'm in a close situation. So many combinations. I have to study these low and high notes etc. Sandalwood relaxes me. I use it on my neck so I can smell it as well as absorb it. I keep it at home and carry it in my purse. I blended this with orange, frankincense, and myrrh in the FCO as a carrier to make a very nice beard oil. Makes my beard and mustache soft without leaving it greasy. The rest of my face seems to enjoy it as well and as an added bonus within minutes I can feel a very pleasant relaxing sensation wash over me. I love the way this stuff smells. I have also found that when I am restless and cannot sleep a single drop of the neat oil rubbed into the arch of one of my feet will put me to sleep in under 30 min. I am really happy with my purchase and will buy again when I am out. A little will go along way though as this stuff is pretty potent. This is an expensive oil, no way around it. So every single drop is valuable. That being said, it is impossible to get it out of the bottle without taking the dispensing insert out, and woe to you (and me!) if you try to pour just one drop out afterward -- it's too thick to come out with the insert intact, but not so thick that it won't come running out of the bottle if you remove it. If you buy this oil, buy an eye dropper to use with it -- you WILL need it. Otherwise, it's has a nice, earthy scent, but not overpowering. Best for cosmetic or fragrance use; can't really hold its own in a diffuser. It would be most helpful if people would LIST AND DESCRIBE ALL their experiences, their results, from using the oils. Saying simply you "love it and would buy more" or that it's "so helpful" is not so....helpful.... to know what it can possibly do. You would be so helpful to others if you shared all experiences. I'd rather read a lot of that than a short "I loved it." Thank you. Lovely fragrance. Expected it to be more concentrated since I opted for the single oil as opposed to the less expensive blend. It is hard to detect after about 30 minutes. It's not my favorite sandalwood. It smells a little weak with a hint of something else. I really loved the old sandalwoods and this isn't the same. I wore the old one as perfume, but this one smells funky. However, I still put it in my blends and seems to function. it’s not strong enough. I wanted it for my diffuser so my home office would smell wonderful and be a great working environment, but I don’t think it is best for this use, and expensive for it as well. I love Rocky Mountain Oils in general though, so I will keep ordering the ones I like. Is this the sandalwood that is used for skin issues by many? BEST ANSWER: Sandalwood can be used for skin care! Helps nourish skin, making it a great addition to aftershave or moisturizer. Please check out the "description" area on the product page for further information. I personally believe sandalwood works beautifully for your skin...it also acts as a grounding oil for the mind... I also use it for minor cuts; for me it helps accelerate the healing process... You will pay for it in terms of money but is it worth it...АВSOLUTELY! Yes, it is. This is the traditional Sandalwood. I use it and I like it. Yes, it can help with many skin issues. Smells good too. Can I add a few drops of the RMO Sandalwood oil to this Sandalwood Blend for a stronger scent? According to the reviews, the blend needs a higher ratio of pure sandalwood to be able to detect the scent. BEST ANSWER: Yes, you are more than welcome to add more drops of Sandalwood to the Blend of Sandalwood for a stronger aroma. The Sandalwood Blend smells nice, but you need to use several drops to be able to smell it. I use it in a diffuser with several other oils, and it gives some depth to the overall fragrance. I would definitely add some of your pure Sandalwood to give it a stronger fragrance. Are these Oil's SAFE to Use in a Electric Vap/Steamer for whole Room Aroma? i thought harvesting sandalwood in India was prohibted by law due to the devastation of the sandalwood forests there, How do you get it? BEST ANSWER: Great question! We work closely with our farmers to ensure that they are sourcing the Sandalwood with the proper documentation and legal practices. Rocky Mountain Oils feels that essential oils are very potent and can be dangerous if not used correctly. All of our oils are 100% pure, natural, and authentic. They are of the quality to ingest. However, we cannot provide dosing suggestions or directions on how to ingest if you choose to do so. If you do choose to ingest the oils, we suggest consulting an Aromatherapist or trusted health professional for guidance. Another company harvests Indian Sandalwood from a plantation in Australia. Does RMO harvest Indian Sandalwood from trees in India? BEST ANSWER: The country or origin for our Sandalwood is India. It is grown and harvested there.